Justin Peters è il direttore responsabile dell’edizione online del Columbia Journalism Review. Ha lavorato per Slate, The Washington Monthly e per il New York Times. Insieme a Toby Warner ha creato la rivista Polite, la cui tagline è generally interesting. Vive a New York. Justin Peters is the managing editor/web at the Columbia Journalism Review. 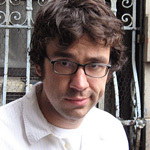 He has written for numerous U.S. publications including Slate, The Washington Monthly and The New York Times. He is also the founding editor of Polite. He lives in New York City.